BARBARA KLEIN: Welcome to THIS IS AMERICA in VOA Special English. I'm Barbara Klein. CHRISTOPHER CRUISE: And I'm Christopher Cruise. This week on our program, we look at the history of root beer. Most Americans know it only as a soft drink enjoyed by generations of children and adults. Yet root beer played a part in shaping the modern food and beverage industry. It even launched the Marriott hotels around the world. BARBARA KLEIN: Root beer is a sweet drink similar to birch beer but popular mostly in North America. Different versions can be made from at least thirty choices of ingredients. These include sassafras, vanilla, wintergreen, cherry-tree bark, licorice root, black cherry and cane sugar. Brewers who make root beer can also use flavorings like nutmeg, molasses, cinnamon, clove and honey. Some versions contain caffeine. A cool treat especially on a hot summer day is a root beer float, sometimes called a "black cow" or "brown cow." You simply fill a glass with root beer and float vanilla ice cream on the thick foam on top. Some people have their own recipes for root beer floats which you can watch them making on YouTube. CHRISTOPHER CRUISE: But some root beers taste like bubble gum or medicine. This helps explain why not everyone likes root beer. There was even a scene about that in the movie "Big Fan." But root beer is considered a classic American drink. This is thanks in large part to one man. Charles Hires was a pharmacist in Philadelphia, Pennsylvania. At least four conflicting stories are told about how he came to find or create his recipe for root beer in the eighteen seventies. Hires called it "The Great Health Drink." He sold it in his drug store under the name "Hires Root Tea." BARBARA KLEIN: At some point, Charles Hires renamed it root beer, perhaps to appeal more to beer-drinking men. Early versions were a combination of bitter and sweet. He experimented. He used flavorings from trees and plants like sassafras and sarsaparilla, wintergreen, birch bark, herbs and juniper berries. He mixed them and boiled them until he had what he considered the perfect combination. By eighteen seventy-six he was ready to present Hires Root Beer at the Philadelphia Centennial Exhibition. That event celebrated America's one hundredth birthday. The Philadelphia exhibition also included Alexander Graham Bell's telephone, Heinz ketchup and the Remington typewriter. CHRISTOPHER CRUISE: Charles Hires did not invent root beer. The Library of Congress has cookbooks that contain recipes from ten or twenty years before he began to sell his version. But Hires gets credit as the first person to produce and market root beer throughout the country. He sold his health drink cold. People could buy it in bottles, but some people liked to make their own root beer. So he also sold root beer kits. Hires sold a powder mix and a liquid extract. He sold the extract to local brewers around the country. They added water and prepared the root beer. Today this idea of selling syrup to locally owned bottlers can be found throughout the soft drink industry. Charles Hires also believed strongly in the power of advertising. He advertised his root beer in newspapers and on trading cards. Hires wrote about how he became successful in an article published in nineteen thirteen in the American Druggist and Pharmaceutical Record. You can find a link to that article at voaspecialenglish.com. BARBARA KLEIN: Over the years, America's taste for carbonated soft drinks changed. Colas, like Coke and Pepsi, became much more popular than root beer. Hires is now owned by the Dr Pepper Snapple Group which also sells other brands of root beer. Another brand of root beer with a long history, Barq's, is now owned by the Coca-Cola Company. But root beer has been at the root of some big developments over the years. In nineteen twenty-seven, a newly married couple moved from Salt Lake City, Utah, to Washington. They opened a root beer restaurant. It was small, just nine seats. 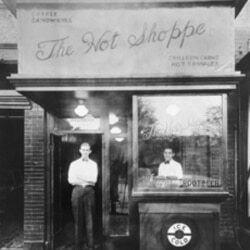 Soon the couple renamed it the Hot Shoppe. We have a picture of it on our website. The couple were John Willard Marriott and his wife, Alice, That little restaurant in the nation's capital grew into the worldwide chain of Marriott hotels. CHRISTOPHER CRUISE: Before it was renamed the Hot Shoppe, it was an A&W restaurant. A&W is a well-known brand of root beer and a restaurant chain. Roy Allen was the A and Frank Wright was the W in A&W. They helped create the idea of franchising. In the early nineteen twenties they began selling franchise licenses to local restaurant owners to use the A&W name and sell its products. A&W also helped create the fast-food industry. By nineteen sixty there were over two thousand franchised A&W restaurants nationwide. They were bigger than McDonald's, but McDonald's soon became much bigger. BARBARA KLEIN: Root beer is also part of the history of the Sonic chain of drive-in restaurants. The company began as a hamburger and root beer stand in Shawnee, Oklahoma, in nineteen fifty-three. Today it has more than three thousand five hundred restaurants across the United States. Almost a thousand of them are in Texas. And, yes, Sonic still serves root beer. CHRISTOPHER CRUISE: There are hundreds of different brands of root beer -- and at least five English-language websites that review them. One is rootbeerbrothers.com. The five men who operate the site are not related, except by a love of root beer. One of the Root Beer Brothers is Adam. We asked him his last name and he said "Root Beer." So, Adam Rootbeer, where do you find the root beers you review? ADAM: "No matter where you go, you're going to find a root beer, and especially for us, wherever we go we look for root beer, and we're always amazed. I mean, just yesterday I unintentionally discovered another root beer that we had never heard of. And it's just so awesome because it's just like finding a treasure every time. Like, what's this one gonna be like, and what's the history behind this root beer? And so there it is, I mean, there's just this huge world of root beer." Adam says he drinks root beer at breakfast and throughout the day. Like many people, he remembers it from his childhood. ADAM: "Some of my earliest memories are with root beer. My grandfather -- it wasn't uncommon for him and I to sit back and enjoy an A&W root beer or a Barq's root beer." BARBARA KLEIN: David Fankhauser is not one of the Root Beer Brothers. He is a professor of biology and chemistry at the University of Cincinnati's Clermont College. He has a webpage where since nineteen ninety-six he has explained a way to make root beer at home. DAVID FANKHAUSER: "I have some decades of experience with making homemade root beer. Root beer can be made with the materials that are readily available in America. It's a homebrew American product." Professor Fankhauser requires his biology students to make root beer at home. However, he does not grade them on the quality of how it tastes. DAVID FANKHAUSER: "It's so simple. With a two-liter bottle you add sugar, you add extract, you add a small amount of yeast and water, cap it up and in two days they've got root beer. And if they do that I give ‘em full credit." You can find a link to his website at voaspecialenglish.com. CHRISTOPHER CRUISE: Professor Fankhauser has his own childhood memories of eating at A&W restaurants. DAVID FANKHAUSER: "And I remember as a child, it was a drive-in. You would go in and a waitress would come to your car and take your order and she would bring out a frosted, heavy-glass mug which would be filled with root beer." CHRISTOPHER CRUISE: Many local breweries around the United States that make their own brands of beer also make root beer and other non-alcoholic drinks. The Fordham and Old Dominion Brewing Company in Dover, Delaware, is partly owned by the international company InBev. The brewers at Fordham and Old Dominion make many different beers. But their single best-selling product -- over twenty percent of production -- is root beer. Walter Trifari, the head brewer, says the style is based on an old recipe found in the Library of Congress. WALTER TRIFARI: "There's something about the sweetness, the texture. I really attribute it a lot to the honey. Honey's the magical ingredient. It has a lot of magical components to it. You know, it's very healthy for you. It can do a lot of good things. But I think when you infuse it into a liquid, you may not taste it right off the bat and say 'Wow, there's honey in here.' But the honey is definitely giving you some textures on your tongue and the mouth-feel that I enjoy." Walter Trifari says the root beer brings back memories for a lot of people who take tours of the brewery. WALTER TRIFARI: "I think root beer does have a lot of history. And it sometimes takes people -- at least I've seen it here at the bar when they've tried it, or when I mention 'Oh we make root beer,' some of the baby boomers or, or that age group, you know, a little twinkle in their eye of like 'Oh I remember when I used to get root beer.' I think it brings people back a little bit to their childhood." BARBARA KLEIN: You can learn more about root beer at voaspecialenglish.com, the website for VOA's daily news and information service for people learning English. I'm Barbara Klein with Christopher Cruise, who wrote today's program. Brianna Blake was our producer. CHRISTOPHER CRUISE: We leave you with Billy Joel playing his "Root Beer Rag." Join us again next week for THIS IS AMERICA in VOA Special English.